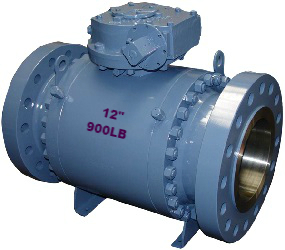 A typical cast steel trunnion mounted ball valve, worm gear operated, RF flanged ends, 2 piece split body, full port, 6″ 600LB. 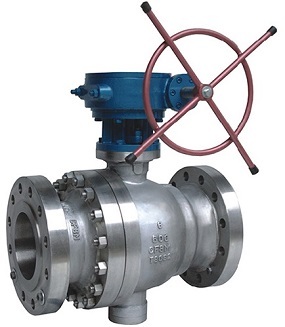 Metals Valve provides cast steel trunnion mounted ball valves in a wide variety of cast materials covering carbon steel, alloy steel, and stainless steel. 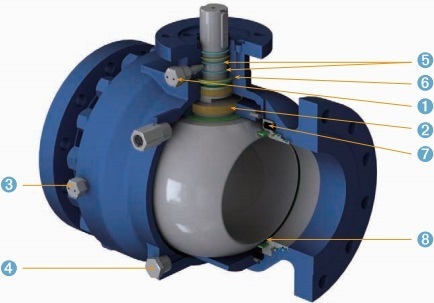 The ball of a trunnion mounted ball valve is fixed or constrained at two pivot points(upper stem and bottom stem). Buy using a bearing at the bottom stem(trunnion), only pivoting movement is allowed within the body cavity. The upstream seat is a floating seat and the process pressure pushes it against the ball’s sealing surface. The seat can also be pre-stressed during assembly, using seats that have a spring action. This design applies continuous pressure against a trunnion-mounted ball after the ball is installed, while the top-works apply a load to the entire closure member. 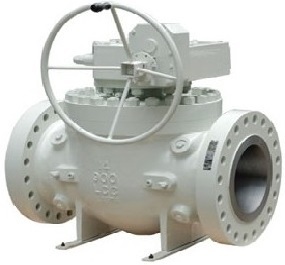 Cast steel trunnion mounted ball valves are often soft seated and can attain a bubble tight sealing. Design standards: API 6D, API 608, BS 5351, ISO 14313, ASME B16.34; Fire safe to API 607, BS 5146, ISO 10497; End connection: ASME B16.5, ASME B16.25, ASME B16.11; Face to face: ASME B16.10; Inspection and test: API 598, API 6D, EN 12266-1. 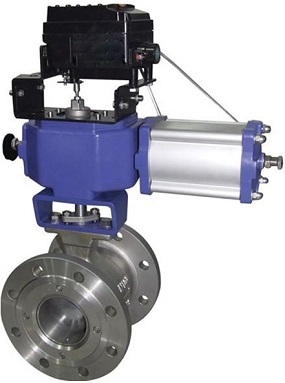 The cast steel trunnion mounted ball valve is available in either full port(FB) or reduced port(RB), 2 piece split body, lever/gear or actuator operated. 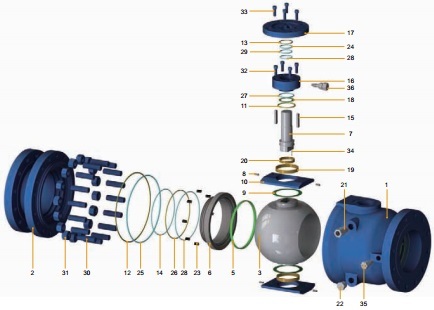 Illustration of design features of a conventional cast steel trunnion mounted ball valve, 2 piece split body with ISO mounting pad. (1) The stem sealant injection fitting is furnished to prevent leakage from the stem in case of emergency. (3) The seat sealant injection fitting is furnished to prevent leakage from the seat. (4) Bleeding/ venting plug to drain the body cavity to avoid over pressure. (5) Double sealing O-rings to prevent leakage from stem area. (6) Gasket & O-ring arrangement to prevent leakage from body joint. (7) Seat spring to exert force on the seat to ensure a tight sealing even at low line pressure. (8) Fire safe design: in case soft seating materials are deteriorated after fire, metal to metal sealing is available. The 3D explosive view of a cast steel trunnion mounted ball valve, 2 piece split body. 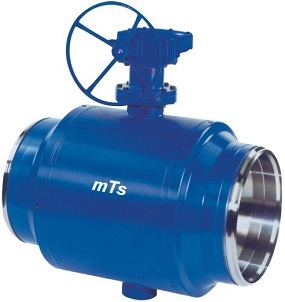 The material selection of cast steel trunnion mounted ball valves, 2 piece split body design. Other materials are available upon request.